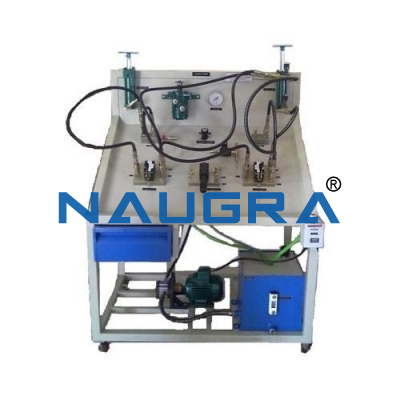 Electro Hydraulic Circuit Trainer outlines the basic Principle of Hydraulic Control System, Hydraulic Control System Components & its applications using electronic proximity position sensor & electro-mechanical actuators (solenoid valves). • Relay Module: - 4 Relays, 24V DC supply, 2 NO/NC contacts, panel mounting type. • Single Acting Cylinder: - Bore: 40 mm, Stroke: 75mm/100mm, Mounting: Foot. • Solenoid Valve: - 2 Nos, 4/3 way, ¼", 230VAC & 4/2 way, ¼", 230 VAC. • Flow Control Valve: - ¼" (F), Square Body. • Block Manifold: - ¼", 4 ways. • Indicator: 24 VDC Operated. • Proximity Sensors: - 4 nos. Type: Inductive 2 wires, Diameter: 18 mm, Sensing Distance: 5 mm. • Pressure Gauge: - 100 Kg/cm2, Dial Size: 100 mm. • Hydraulic Motor (Optional) 3 LPM, Flange mounting type. • Pressure sequence valve (optional):- ¼" (F), Square Body, 60kg/cm^2. • Oil Hydraulic power pack: - MS Powder Coated Oil Tank, Capacity: 25 Litters. • Hydraulic Hoses: - 10nos. • User Friendly, Self Explanatory Systems. • Leak proof Safety Measures, sturdy piping & Robust Construction. • Training Manuals mimic Charts for Operation Ease. • System Frame with Caster Wheel Arrangement for ease in movement. • M.S. powder coated cubical plant with standard Instrument Mountings. • Inbuilt Safety Measures to avoid improper usage. • Wall mounting assemblies of hydraulic actuator & self-reciprocating cylinder. • Hydraulic motor (optional), Solenoid Valves (electro-hydraulic), Limit Switches. • QRC Couplings provided Tubing /hose pipes for circulation of pressure. 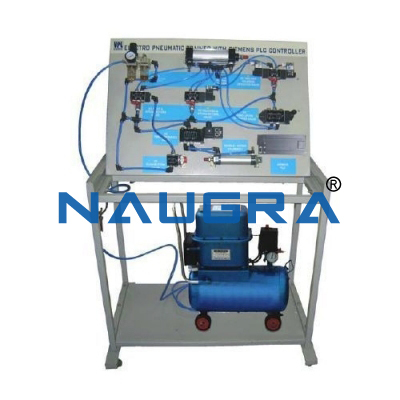 • Oil Hydraulic power pack for power supply. 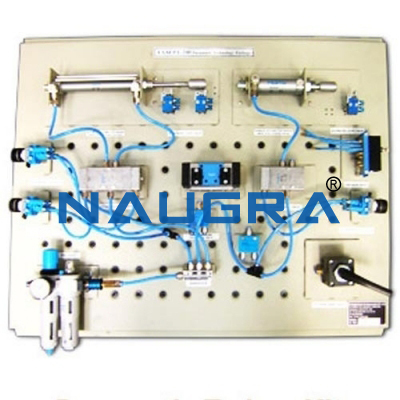 • Optional components are available to allow fault operation and diagnosis training. • Study of pressure control. • Study of direction control. • Study of fundamental principles of Hydraulics & its applications. • Study of Meter-in circuit, Meter-out circuit and Bleed-off circuit. • Study of flow control. • Study of hydraulic valves. • Study of cylinder control. • Study of power pack control characteristics. • Study of hydraulic Motor (optional). • Study of Hydraulic Accumulator (optional). • Study of sequencing of two cylinders using sequence valve (optional). • Study of electro-hydraulic control. • Study of sequencing operation of two cylinders using electro-hydraulic components. 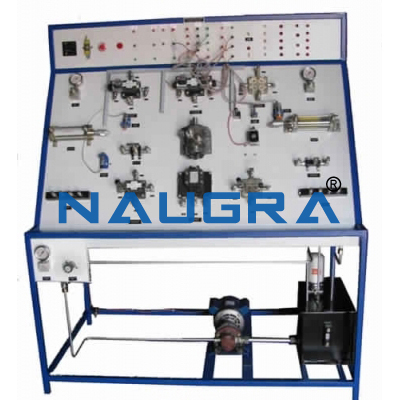 Other Related Teaching Lab Products, Scientific Instruments and Educational Equipments like ELECTRO-HYDRAULIC TRAINER KIT. . .